The Denon AVR-S730H has 7.2 channels and the ability to deliver a more-than-satisfactory performance in a home theater environment. There’s a healthy amount of audio decoders and connectivity options. Denon’s goal to deliver the company’s standard of performance while remaining competitive in the affordability market pursued by other AV receiver manufacturers is reflected in the AVR-S730H. Its competitive price and features like Wi-Fi and Dolby Atmos are an attractive way to announce this home theater package. Perhaps the thing I like best about the Denon AVR-S730H is the unit’s clean face. There’s no overloaded front panel filled with randomly scattered buttons. Instead, there’s an organized arrangement of convenient choices including sound and input mode buttons. Seriously, I use the remote for adjustments instead of an outdated (and highly inconvenient) system that’s only needed when the remote’s lost or unavailable. Perhaps Denon’s paid attention, because there’s an app for that in the Google Play and Apple stores which replaces the remote when it can’t be found. Two analog audio inputs and two optical inputs allow connection to older types of audio equipment. Add in the single HDMI output and six HDMI inputs to get a satisfactory amount of video sources. All six HDMI inputs are 4K and 3D video compatible. The AVR also supports HDCP 2.2 so the content protection encryption is read on DVDs and Blu-rays. 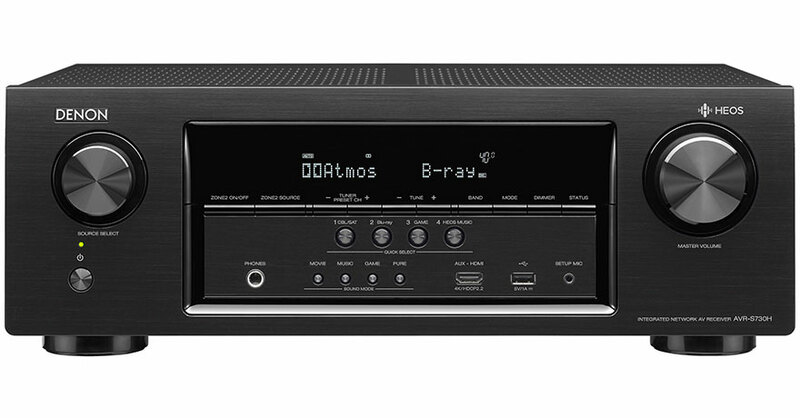 The Denon AVR-S730H surround sound receiver supports both DTS:X and Dolby Atmos. The benefit of powering two overhead channels is slightly diminished because the option overrides the surround back channels. The intensive sound during the metallic object lift in Transformers: Age of Extinction demonstrated the 3D immersion that Denon hoped to achieve with the AVR-S730H. The receiver decodes several music formats, including ALAC, MP3, and WAV. Music’s a good way to test sound quality without getting distracted by video, so the convenient USB plug up front is a bonus. It’s easy to connect a thumb drive or external hard drive filled with favorite tunes. I didn’t stream music from iHeart, Sirius, Tidal or any of the other services supported by the multi-room HEOS built-in music system during the AVR-S730H review. Instead, I listened to and enjoyed the immersive sound from the speakers from Windows Media Player (WMA). It’s challenging to learn the steps needed to master the HEOS app, but worth the effort. The Yamaha RX-V583 and Denon AVR-S730H are similar in many ways. Examples I especially like are easy setup, a free app that serves as an alternative remote, and great sound even with less than stellar speakers. Denon uses Audyssey MultEQ while Yamaha analyzes and sets optimum room calibration with its Parametric Room Acoustic Optimizer (YPAO). Both processes take less than half an hour to complete. I did notice that YPAO delivers a near-perfect setting to begin, and that just a bit of tweaking adjusts the audio (especially bass!) to personal preference. Audyssey Dynamic Volume adds a smooth volume level that reduces irritating increases in sound. Its EQ performance achieves listening clarity with clear sound effects and dialogue. While the AVR-S730H has powered multi-room audio output, the RX-V583 has none. The V583, however, has 7 audio-video inputs compared to the S730H, and 4 audio-only inputs compared to the V583’s one. 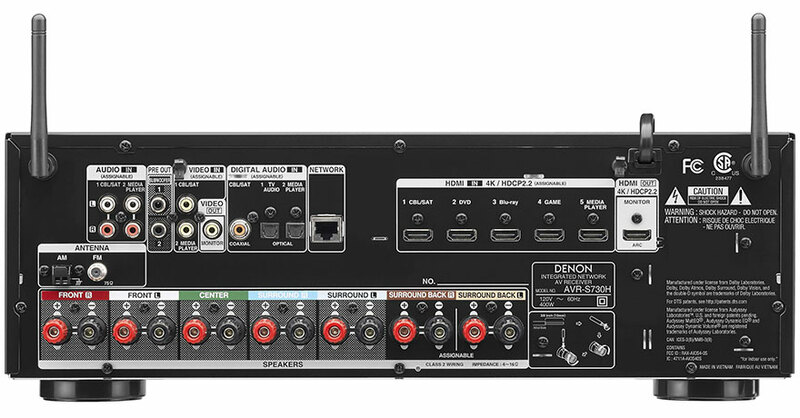 Yamaha has just 4 HDMI inputs, two less than those of the Denon AVR-S730H. Both have a convenient front USB connection. Five HDMI inputs and one output are conveniently located on back panel. Three ways to control receiver. Power output is slightly lower than similar units. The Denon AVR-S730H has solid sound quality and all the features that make it a reliable home theater package. Wi-fi and Bluetooth make it effortless to wirelessly send audio to the surround sound system from the computer, smartphone or tablet. It has nicely balanced audio and three ways to control the remote, including the easy to use smartphone app. This economical, well-designed AV receiver brings home the pleasure of Dolby vision, 3D sound, and the enjoyment of viewing favorite movies when the mood strikes for a theater showing right at home. Getting familiar with the assorted programs is an enjoyable process. The more you know about available setup steps, the better visual and audio performance is achieved. Use the AVR-S730H for an introduction to Dolby and 4K at an affordable price. If you upgrade in a few years, the unit will still be appreciated in the game room, basement, or second home.